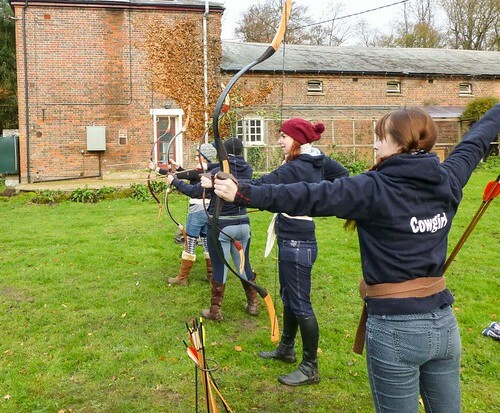 I returned to the Centre on the last day of November, a little stressed out by moving house, ready to spend the day learning about horseback archery and jousting. My only experience of these things was watching Lord of the Rings and A Knight’s Tale, and thinking it all looked pretty cool. I was up for it, giddy with excitement. I joined three of my university riding club colleagues, most of us sporting our club hoodies. Nerds. We began the day suitably with a cup of tea and a biscuit while we learned some basic etiquette when it comes to archery. Then we went out on foot to learn some technique and practise shooting. Karl talked us through each step of nocking our arrows and shooting. The targets were at this point only about ten feet away, and after a couple of tries, we started to hit them. Horse archery is quick, intended to be a hit and run technique, so once the arrow is in place on the bow, the draw and release is fast. The aiming process is vague, instinctive and surprisingly effective. I plugged in my dancer brain again. I like methodical movement patterns, and this was no exception. Karl’s voice was measured and rhythmical as he called out the instructions, and it did begin to feel like a glorious dance. I wasn’t entirely sure how this was going to translate into the saddle, but I was very much enjoying the skill on the grass. Until, that is, I twanged my bowstring against my forearm. That was quite painful. Karl had a helpful suggestion for how to avoid that. We had races: who could release their three arrows the fastest, and then more competitively, who could release their three arrows the fastest and the most accurately. Being ferociously competitive (when I’m winning), I won most of these little races, beaten once on score by a slower but more accurate archer, and once when I had my bow upside down and took a little while to figure that out. I was discovering a rather deadly and predatory side to myself. We went back inside for another biscuit, and I realised I was ravenously hungry, and maybe that had something to do with my killer instinct. Then it was time to go up to the grass archery track with our trusty steeds and try it from horseback. I was paired up with Buddy, a gentle piebald cob with a forelock so long I wondered if he could see where he was going – but he didn’t put a foot wrong all morning. All of the horses were completely nonplussed by the various bows and arrows being waved around by the four amateurs, and Buddy seemed to know exactly what he was doing. We were led down the track at a walk first, to get a feel for it with as little pressure as possible. It was a curious feeling to being doing something other than focusing on the horse. “You’re riding from the waist down and shooting from the waist up,” Karl said, reminding me to use my legs to keep Buddy going. I’ve never felt so useless at multitasking. Each turn that we took on the track, we were left more and more to the care of our horses. It was slippery out there, and we were the last archery course of the season, so the advice was to go along the track in trot. However, it was pointed out that our hands would be busy with our bow and arrow, so the horse was likely to go as fast as the horse was going to go. 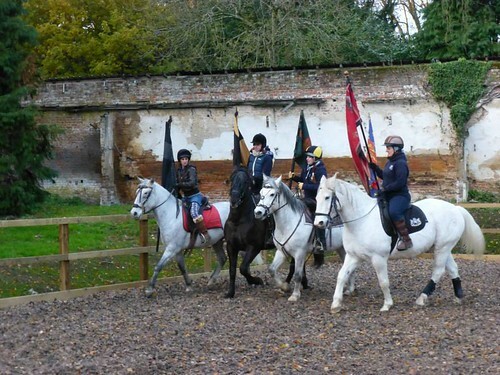 We were warned that the horses might break into canter, because that was what they were trained to do for archery, and that we could either go with it, or we could concentrate on getting a nice trot going before we bothered to sort out our bow. I managed to drop one arrow, and shoot another one off into the grass. Buddy slowed almost to a stop of his own accord before we’d reached the end of the track, and sighed contentedly as we waited with the other horses for everybody to take their turn. We had a few runs each, and each time I trusted Buddy to take me from one end of the track to the other. I tried to concentrate on my technique, but it was well and truly out of the window. I actually felt quite emotional up on the hill, surrounded by green fields, autumnal woodland and the quiet. On the track there was just me and Buddy, the sound of his big feet on the grass, my fumbling ineptitude with the bow, and the final satisfaction as I managed to hit one of the targets on my last pass. I’ll sound hokey and out of my mind, but it was an almost spiritual experience. The sense of partnership was overwhelming. The focus on the archery brought a stillness of the mind, a meditation in itself. I felt more sensitive to the horse beneath me than I ever felt in the riding school. Maybe that was the Cossack saddle giving me more biomechanical feedback, maybe it was because I was more mindful of everything I was doing. I trusted Buddy completely. I didn’t doubt him for a moment. That was strange to me – I’ve spent months expecting every horse I rode to be planning to throw me. The fear and anxiety was gone, and what I had experienced out in the field was something wonderful. As I picture it now, while I write this, I feel almost tearful. The last time I felt this way was standing in Yellowstone Lake, finally letting a deep depression wash away. Hokey out of body/mind experiences aside, we stopped for lunch, and I was sad that we were just doing a morning of archery. It was as if our dance class had ended just as I was figuring out the steps. I expect I will go back for more archery in the spring. The afternoon was dedicated to jousting. What an absurd occupation for four girls who usually trotted serpentines, but we were handed a lance and I did my best to engage my puny biceps and not drop the thing. On foot, and spaced out from each other, we were taught how to safely lower the lance and bring it in to play without cracking our steeds in the skull. Then we learned how to lift it up again. Karl makes it look effortless. It probably is effortless for him, I am quite sure his arms are well-defined beneath his winter coat. My arms are mostly just for show, and I can occasionally muster five very poor pressups, but that’s about my limit. The lance was unwieldy. I had no idea how I was going to manage. I had another bizarre moment of wondering why I wasn’t worried, and this confusion continued as we rode around a little bit to get a feel for the horses. Smokie was obviously ready for action, and I wondered why I wasn’t feeling short of breath, why my heart wasn’t racing, why I wasn’t thinking of how best to say I wanted to get off him immediately. I didn’t want to. I paid no attention to anybody else, just spoke to him softly and he settled down reasonably quickly. He was so light and responsive. I felt spoiled. I felt like I should give him back because he was far too good for me. We were challenged to ride in tight formation around the arena, four abreast. Smokie pinned his ears and nipped at his fellow horses as we went around the arena, just being cheeky as Zana had said, and doing exactly what I was asking him to do. I wondered why I wasn’t bothered, why I was laughing at his behaviour, why I found it endearing. Must have been that hypnosis, I told myself, inwardly shrugging and getting on with the task at hand. We were each given a standard to carry, and challenged to keep formation with just one hand on the reins and something to carry as well. We were terrible. I had a new appreciation for the horsemen of ages gone by. The one-handed thing wasn’t so alien to me, after my western experience, but to carry a great big pole and try not to bash my friends in the knee was something else altogether. Smokie and I (second from the right) muster the troops. Badly. 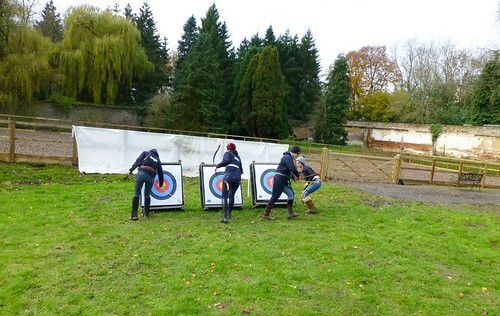 Then we were challenged to ride past a target on the ground and throw a spear into it (spear may not be the correct technical term, but I’m a disgusting peasant). Karl handed me the spear and said “Smokie’s great at this. He can do it, no problem.” I had to laugh. I had every faith in Smokie, but my terrible hand-eye coordination would be what let us down. Karl was right: Smokie took me right to the target every time. I was also right: I didn’t hit the wretched target once. I really wanted more practice at that, but we had other things to do. We learned how to charge down the tilts at each other, with our invisible lances. We learned how to turn at each end tightly, so as not to lose ground and to keep the horse’s well-trained pattern intact. Smokie was a marvel. When I reached the end of the tilts and we stopped at the fence, I looked over my left shoulder like I’d been told. Without having to touch my reins or use my leg, Smokie wheeled beneath me like an equine ninja. I laughed the whole time, just delighted. He was such a joy to ride. Then the ante was upped. A shield went on to my left arm, which banged nicely on my patella as I’m a little short, but the colours did match my hat silk, so I can’t complain. A fake sword went into my right hand, as a substitute for a lance, and I learned that tilting with a shield was a great way to get some localised bruising. The dancer in me views this bruised knee as a badge of honour. It’s a sign that I trained harder than the people without bruised knees. I earned that bruise. Tilting was a huge amount of fun. I caught myself issuing a very middle class warcry. Smokie continued to be a total rock star. I was falling in love. We did not tilt at each other with the lance – safety prevails at the Centre and they don’t allow anybody to do anything foolish, so our final challenge was to be done alone. Shield on arm, lance in hand, we aimed at small targets and a quintain. I watched the others go before me, and as I positioned Smokie ready for our run, I could tell he had his eye in. He was poised, as excited as I was. I grappled with my lance, and he fidgeted, evidently unimpressed by my inability, and ready to just make our run. He threw his head about as I tried to get coordinated. I wondered why his fidgeting wasn’t making me panic. I was quite happy to sit there, comfortable that he was keen to get on with his job and nothing bad was going to happen to me. We set off at his lovely canter, and I gaily missed every single target on our first pass down the arena, and missed the bigger target of the quintain. I managed to do all of that without once cracking my marvellous steed in the head with the lance, which was my only worry. When I was relieved of my equipment, I had to sigh happily. I felt like I’d just won the Olympics. As we walked around the arena to cool the horses off, I had another hokey spiritual moment, and a tidal wave of love for Smokie swept over me. He had given me a wonderful afternoon, done his very best for me, and I wished I’d been more skilful. To ride him was such a privilege. The day had shown me that I could have a vast amount of fun with a horse without having to go in circles in the riding school. 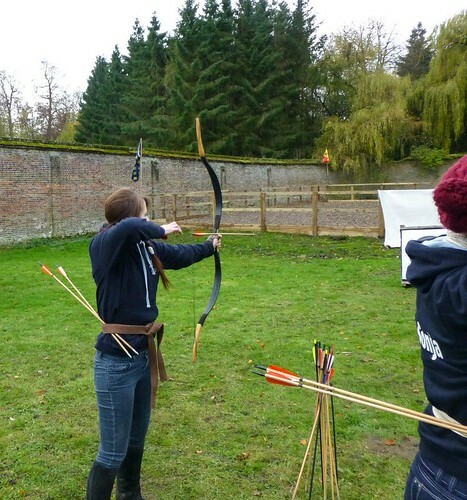 Archery really worked itself into my soul, and it’s something I hope to do again before too long. My short time with Smokie was a valuable lesson in what I was capable of, and I hope it was because I trusted him that he showed me so much of his impressive talent as a stunt horse. He taught me a great deal in that arena. It is a true credit to Karl and Zana’s work on my confidence that I experienced this second course the way that I did. Nerves never hit me once, it was a day of unbridled (pardon the pun) joy and pleasure. My two days with them was life-changing, and affected me in ways I never imagined. From reading the testimonials on their website, it’s obvious that I am not alone in this feeling, and they deserve every word of praise that they get. I hope that I have not seen the last of these generous people and their amazing horses.